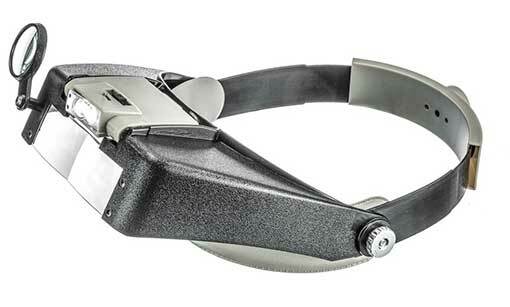 Forget watchmaking, you could write the "A Tale of Two Cities" on a piece of tortellini with this triple magnifier visor. Magnifies from 1.8X to 4.8X. 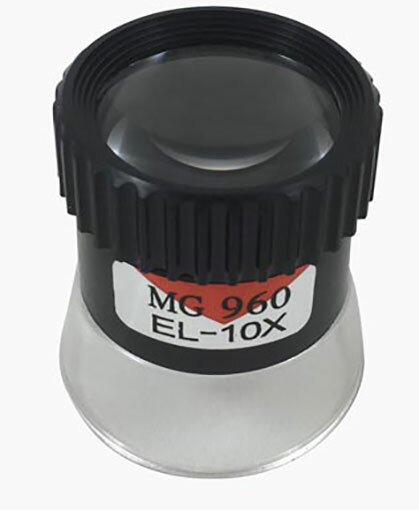 Has a permanent and flip-down 1.9X lenses, and a flip-down 4.5X loupe. Dual white LEDs in a pivoting mount, powered by (2) "AAA"s each which aren't included. 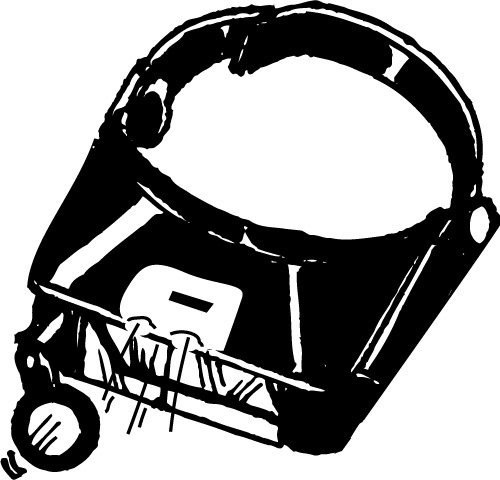 The whole thing is in a black plastic visor, 7-3/4" wide x 5-1/4" deep with a flexible plastic strap with adjustable dial control. Opens to 9" max dia and has coated acrylic lenses. 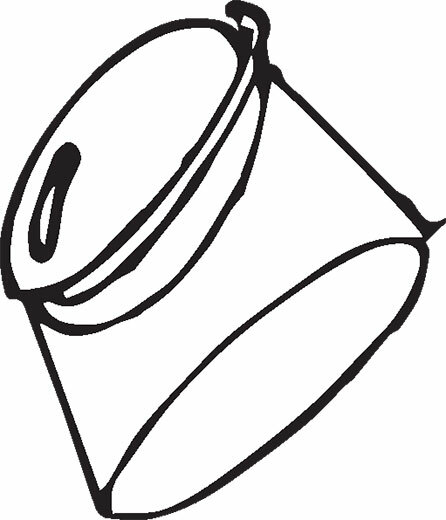 Now then: It was the best of times, it was the worst of times…..
Good things come in (2) different small packages. 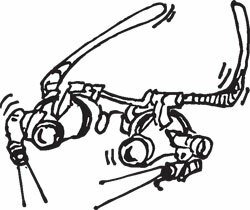 Our pocket microscopes are compact and perfect for a clear, close look at stamps, coins, flora, insects or assorted minutiae. 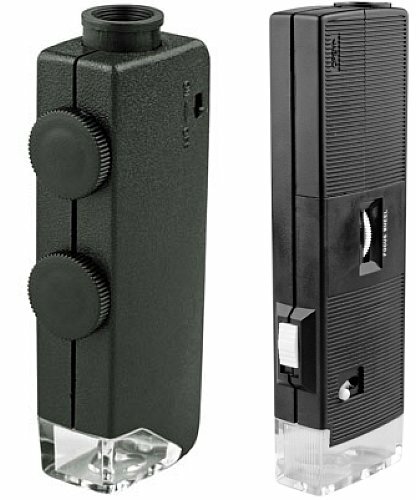 The 30X version measures 5-3/4" x 1-5/8" x 3/4" in black plastic with a focus knob, on/off switch, small LED for illumination, and a vinyl carrying case. 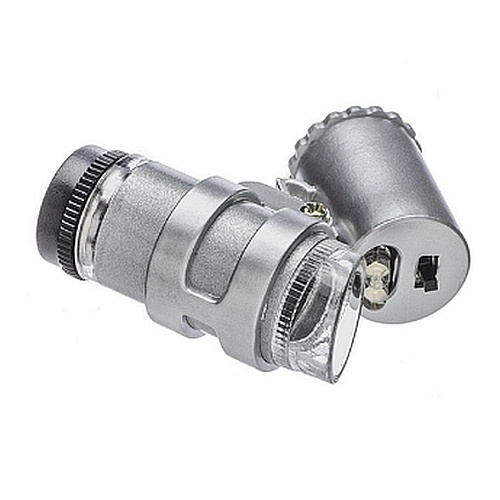 Requires (2) "AA"s. The 60X version is a microscopic 3-1/4" x 1-3/16" x 3/4" and has a built-in white LED illuminator powered by (3) coin-cell batteries that are included. Magnifies from 60-100X, with coarse- and fine-focus knobs, and has a vinyl carrying case. And more. 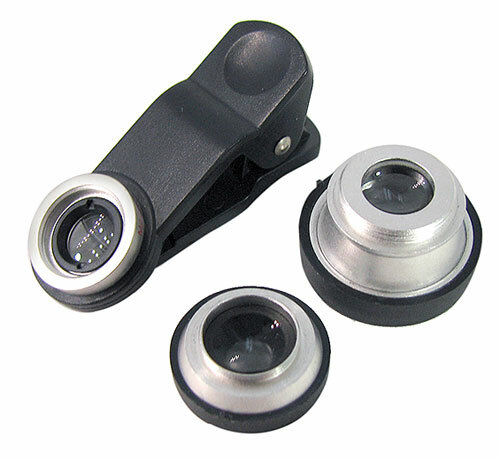 This accessory kit for smart phones (works with iPhone, Samsung, HTC, iPad, tablets and many others) has a 2” long clip-on bracket with screw-in macro, wide-angle and fish-eye lenses. Paul loves his kit and he’s our optics expert. 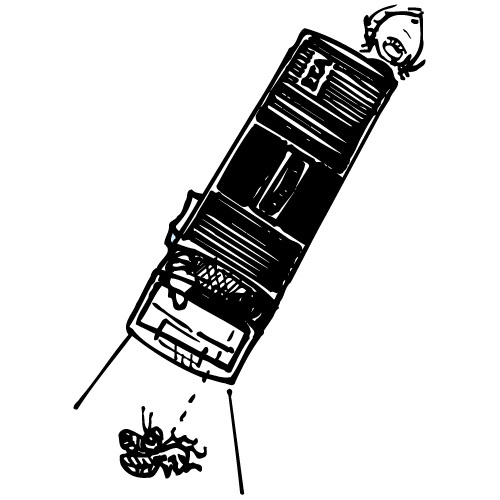 Use the macro for insects, coins and diamonds. Fish-eye and wide-angle for great visual effects. Includes a little pouch to carry it all in, and tiny lens caps. Note: Two lenses come threaded together to conserve space. 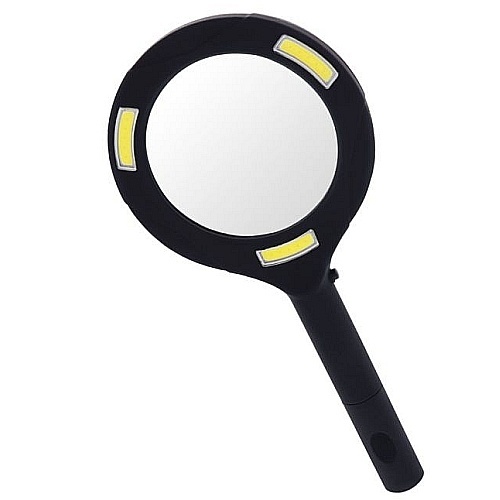 This XL magnifier measures 3-3/8" dia with a 5" long handle, all rubber coated. Glass lens is 1.5X and surrounded by (12) bright white LEDs that run on (2) included "AA" batteries. Tap-on, tap-off switch. Good for everything from reading to looking at bugs and such. Steampunk alert! Also…model and jewelry maker alert! 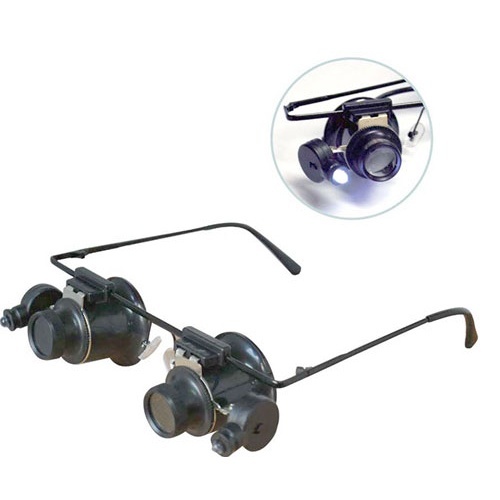 This pair of 10X acrylic doublet loupes is mounted on black eyeglass frames and flanked by LED lights powered by (2) included CR1620 button cell batteries. 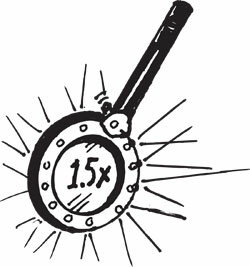 These are for close work only, from 1" to 1-1/2", and can focus only one lens at a time (not both on the same object) so if you’re a steampunker looking for a new accessory, plan on perching this rig on your pate or chapeau. Green Laser Pointer Par Excellence! Da Mare could use this to point out cracks in the infrastructure at Wrigley Field. You, having a forgiving nature, will resist the urge to point out cracks in da mayor's infrastructure. You will, of course, use it to point out chimney cracks to the tuck-pointer, a cracked limb to the tree-trimmer, and the crack in your profit picture during a slide presentation. You can do all that and much, much more with the bright light from this 5mW green laser pointer. It's an unbelievable tool. 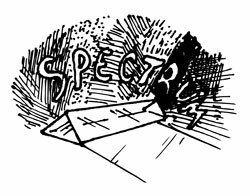 If you need a laser pointer that seems to go on forever and is so strong that you can actually see the beam in the dark, it will be the best low-cost investment you ever made. Or the coolest high-end toy. The 532nm Class IIIa light is 5-5/8" long x 1/2" dia, with (2) "AAA" batteries (included), a momentary-on switch, pocket clip, and case. An absolute necessity for construction, surveying, warehousing, inspection and other large sites. And for playing in the dark. 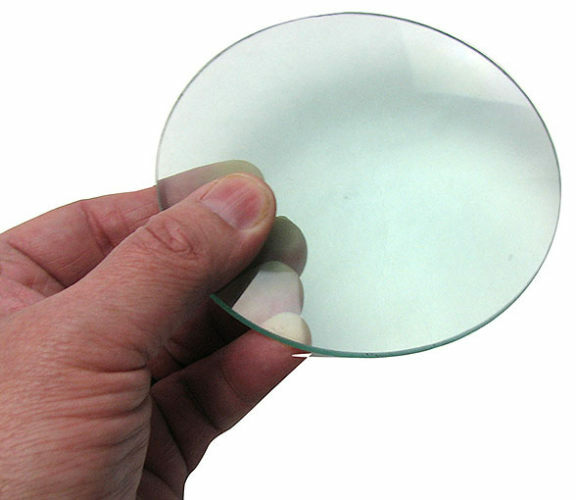 Flat plastic Fresnel lens. 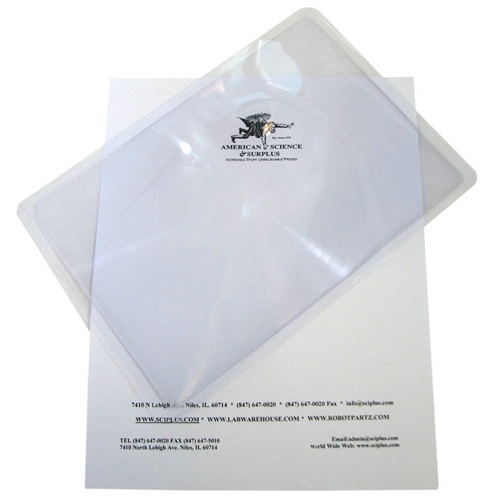 This flexible magnifier is 7-1/4" x 10-1/4" and only about a millimeter thick. 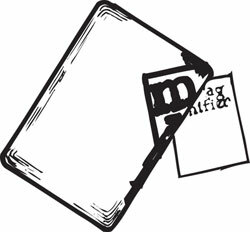 It is great when you need to scan a list or to look for something in a directory. You can see most of the page without moving the magnifier. Only about 1.5 power, but that can make a huge visual difference. The quality is not high, but neither is the price. No lights, no cases, no frills, but nice quality, nice price, just plain nice acrylic loupes. You pick the 6X, with a 23mm lens, and a height of 1-7/8”; the 10X with a 23mm lens, and a height of 1-1/2”; or the 15X with a 21mm lens, and a height of 1-3/16”. Tarklika, our Chief Thread Count Verification Officer claims that these have tripled her efficiency, just imagine what they can do for you. 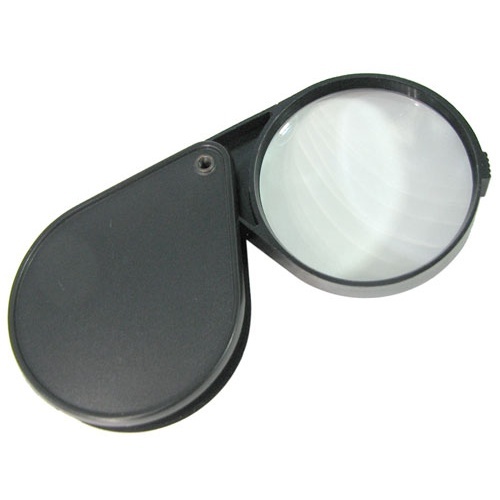 A nice 3X loupe, 2-3/8" dia, that folds into its own 3-3/8" x 2-5/8" tear-drop-shaped plastic case, and it's only 5/8" thick, just right for sliding into your pocket. Pay no attention the "6X" markings on the package-if mistakes didn't happen, we wouldn't be in business. There's optical science and high school physics, and then there's making pretty colors with this little 4-1/2" x about 1" acrylic prism. It makes the same rainbows that the beveled edges on the glass in the French doors to your grandmother's living room used to make on the floor in the afternoon while she was making supper. If you had a grandmother with French doors with beveled glass, who made you supper. 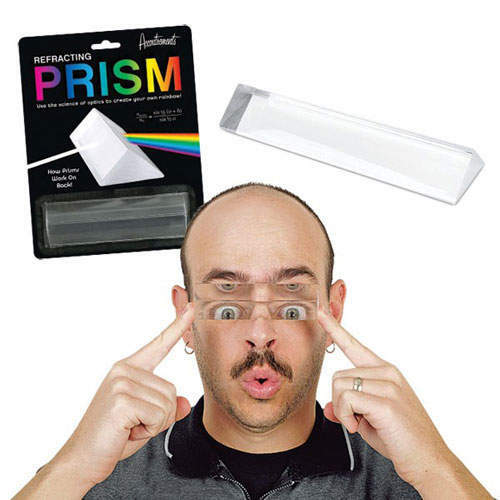 If not, you'd better buy this prism or you won't have anything to remember after she's gone. We don't like to brag, but it's tough not to in a case like this. This is a wonderful pen-shaped laser pointer, 5-1/4" long, flat black or silver with gold pocket clip and head. It throws a red point a loong way (we've thrown it two city blocks at night, and it would've gone farther, but buildings got in the way). And what are we so proud of? We've seen a very similar item-not identical, mind you, but essentially the same-in one of those glossy, toys-for-grown-men catalogs. Their price? $20! We're proud not to be profit-mongers, buy it here and you can take pride in your smart shopping habits. Batteries included. You do close work? Slap on these eyeglass-style magnifiers and make your life a bunch easier. The plastic frames are 5-1/2” wide with adjustable interpupillary distance, 4-1/2” long temples and an adjustable 12” elastic strap. 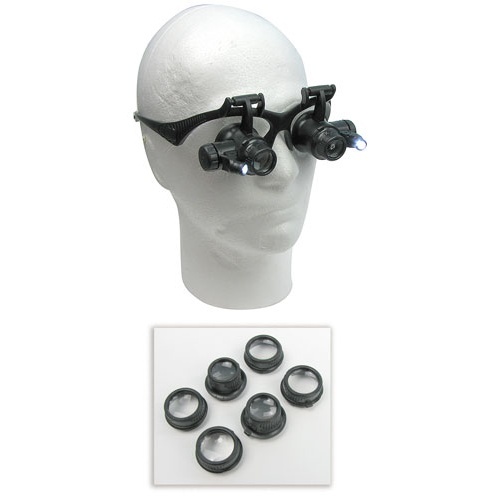 Comes with (4) sets of lenses, 10X, 15X, 20X and 25X, illuminated by LED arms at the sides of the lenses. Replaceable button-cell batteries included. These could also be the steampunkiest-looking item we’ve ever offered. 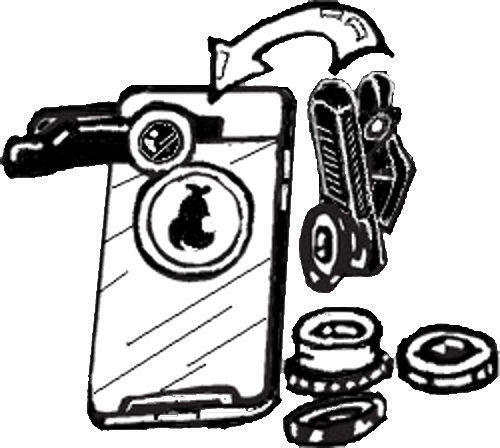 Clip this little lighted scope onto your smart phone and use the phone's zoom feature to show images (and take photos) up to 30X magnification. Our Optics Guru Paul says it has no business working this well for under ten bucks. 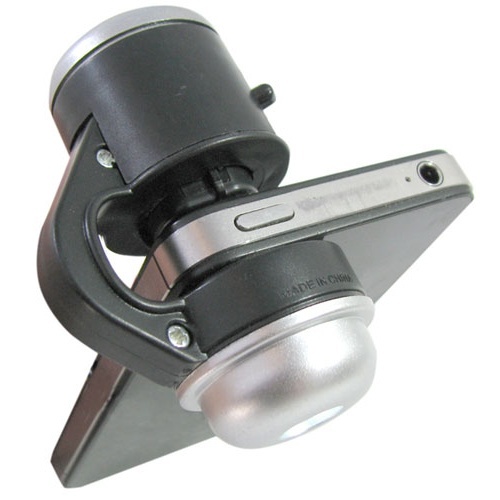 Measures 2-5/8" x 1-1/4" and comes with (3) replaceable button-cell batteries for the light. Fits most major brands, like iPhones and Androids and Windows (oh, my! ), and probably most tablets, too. 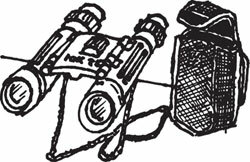 Small enough to fit into the belt-mounted black canvas carrying case (4-3/8" x 3" x 1" thick), but they open up to be plenty big for most binocular needs. 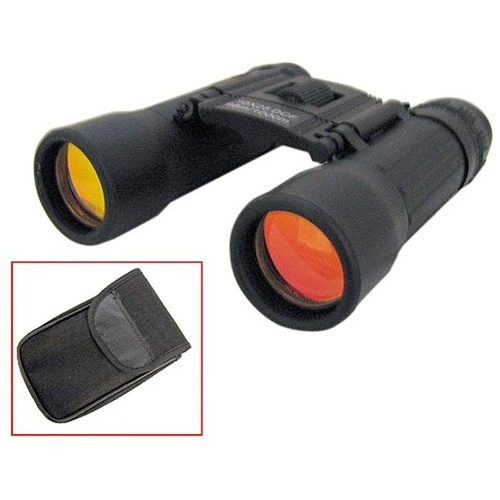 These 10X25 binocs have glare-reducing coated lenses, a thin neck-strap, adjustable focus, water-resistant and easy-to-hold rubber skin, rubber eyecups and fine-tuning for the right eye. 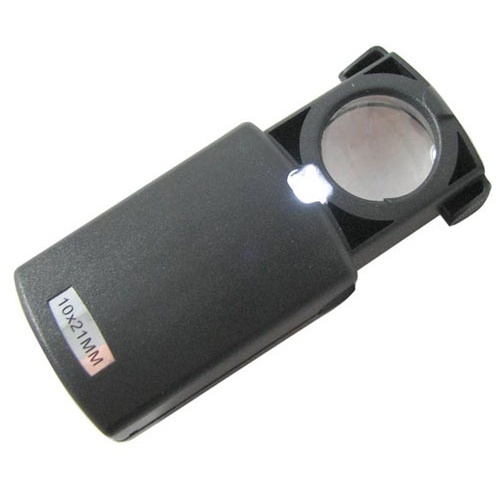 This little 5X, 3/4" dia glass magnifier for home, business or hobby use slides into its own 2" x 1-3/8" x 3/4" black case. 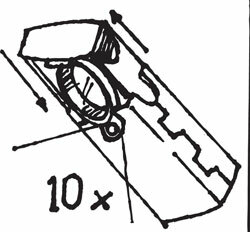 Slide the magnifier out all the way and it automatically turns on the white LED light, just like your fridge, except it's not cold. (Don't want the light? Just pull it out part-way.) Runs on (3) button-cell batteries, included and replaceable. Call it pocket microscopy. 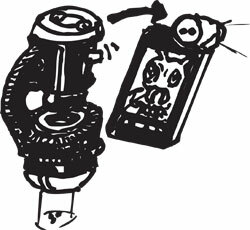 Our teensiest tiniest double-lens microscope is just 1-1/2” long x 19/32” dia with a barrel that will pull out another 1/2” for coarse focus. 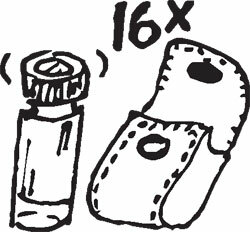 Rated at 16X, and comes with a teensy tiny carrying pouch. Big glass lens, measures 109mm (4.29”) dia, with a 255mm (approx 10”) focal length. No use for a lens? It makes a lovely desktop magnifier, plus it’s convex on both sides which makes it very satisfying to spin during introspective moments. 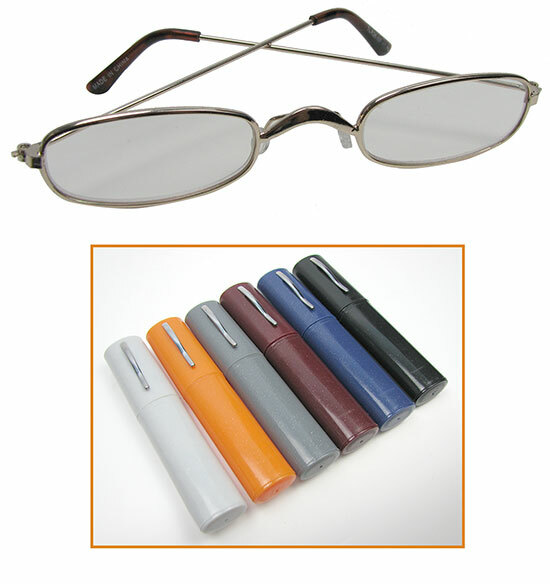 Low-profile reading glasses (AKA readers) with small 1-3/4" x 3/4" lenses. The frames are all the same delicate style and come in assorted colors to match the slim, plastic carrying case with the pocket clip. 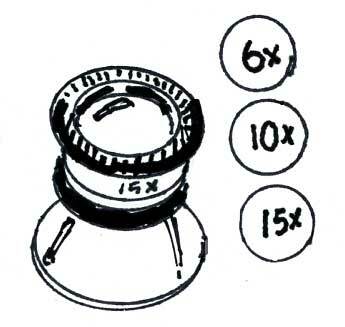 The plastic lenses are 1X, 1.25X, 1.5X, 1.75X, 2X, 2.5X, 3X. 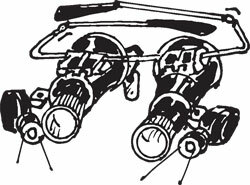 Our package of (3) pairs will be in assorted magnifications & colors (our choice). Note the incredible price -- these sell for up to $12.95 EACH at your local pharmacy!